Juba - About 400 British soldiers will join the UN peacekeeping force in South Sudan in the next weeks in one of Britain's largest operational deployments worldwide, the force said Tuesday. A statement said the first of the British troops, "proudly wearing their distinctive blue UN berets, arrives in Juba today to join the United Nations Mission in South Sudan." The British contingent, the first to join the 13 000-member UNMISS force since it was set up in 2011, is made up of medics and military engineers. 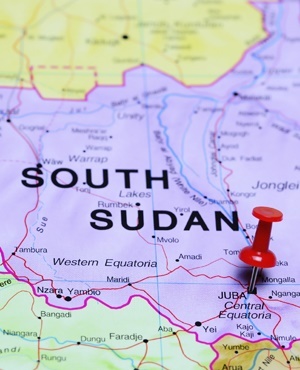 The engineers will be deployed at UN camps housing displaced civilians in Bentiu and Malakal in the north, where they will help improve routes, security and drainage. Almost 80 medics will staff a hospital in Bentiu that provides care for civilians as well as for the 1 800 UN peacekeepers based there. The deployment of the troops comes three weeks after Britain's International Development Minister Priti Patel said the targeted killings of specific ethnic groups in South Sudan amounted to "genocide". But the decision to join UNMISS dates back to the former government headed by David Cameron. After gaining independence from Sudan in 2011, the country descended into war in December 2013, leaving tens of thousands dead and more than 3.5 million people displaced. More than 1.9 million people are internally displaced and more than 1.7 million have fled to safety across the country's borders. In February, South Sudan and the United Nations formally declared a famine in parts of northern Unity State affecting 100 000 people, a disaster UN officials said was "man-made" and could have been averted.